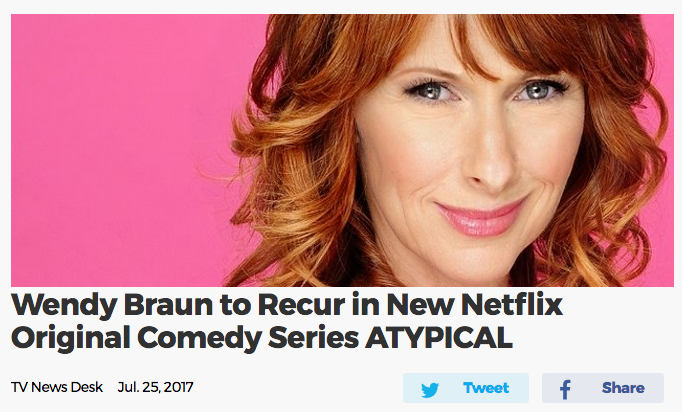 So excited to be recurring opposite Jennifer Jason Leigh and Michael Rapaport as ‘Kathy’ in the new Netflix original heartfelt comedy series Atypical. Created by Robia Rashid, Atypical follows Sam (Keir Gilchrist), an 18-year old on the autistic spectrum who is looking for love and independence. His quest for a “normal” life also impacts his family in ways that no one could have predicted. I step into the storyline as ‘Kathy,’ the leader of a local autism support group and friend to Sam’s mom (Jason Leigh). To join this uniquely relevant coming-of-age comedy where I get to play a character that tries to be positive and hopeful, yet is direct and (deeply) flawed was an amazing experience. We really are all trying to find our own version of normal. Read the full article that Broadway World did on me here. Side note: Many times while driving to Valencia to the stages where we shoot, I would see the most magnificent rainbows.